We want to figure out when it is appropriate to have a stop-sign at an intersection versus a stoplight. In Part 1, we made some assumptions about stop-sign wait time modeling and developed an equation that gave us the total wait time as the dependent variable and the number of cars as the dependent. In this post, we’ll try to model the total wait time based on the number of cars at a stop light. 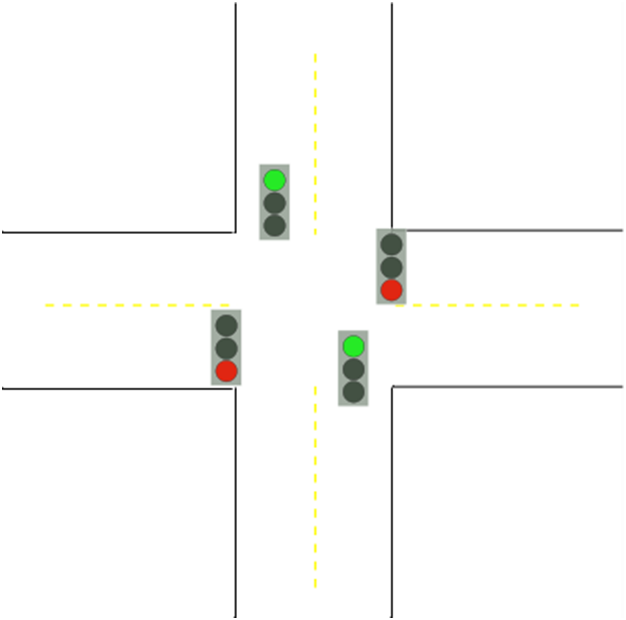 Assumption #4: This is an equal opportunity intersection. That is, each direction (N,S,E,W) sees 25% of the traffic. So half the traffic will be waiting at any given time, while half will have a wait time of zero. Assumption #5: Stop-to-full-speed time = 15 seconds per car. Assumption #6: The stop-light has a stop-time of 60 seconds. Assumption #7: It’ll take about 2 seconds for each car to get through the intersection. 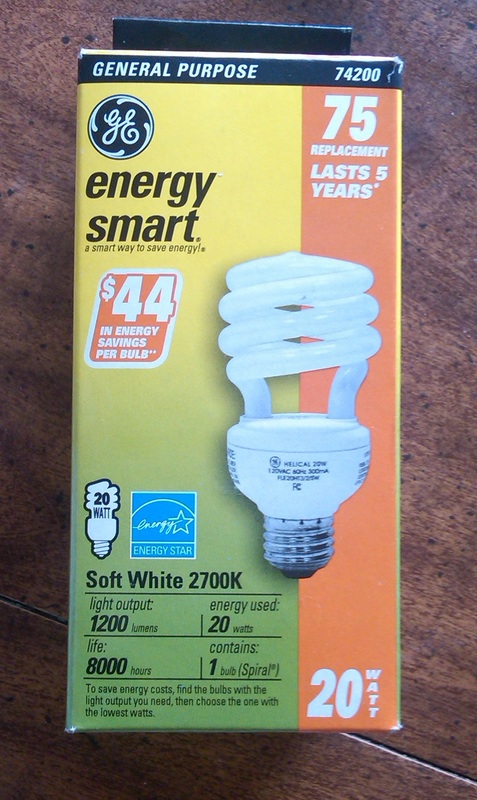 Rather, 2 extra seconds that we wouldn’t have used had there not been any light there. And if there is in fact a three-second delay in between green lights? Super. So if we compare this model equation against the model equation from Part 1, we get this graph. So somewhere between 2 and 3 cars being at an intersection is the point at which it becomes beneficial to have a stop-light instead of a stop sign according to our model. 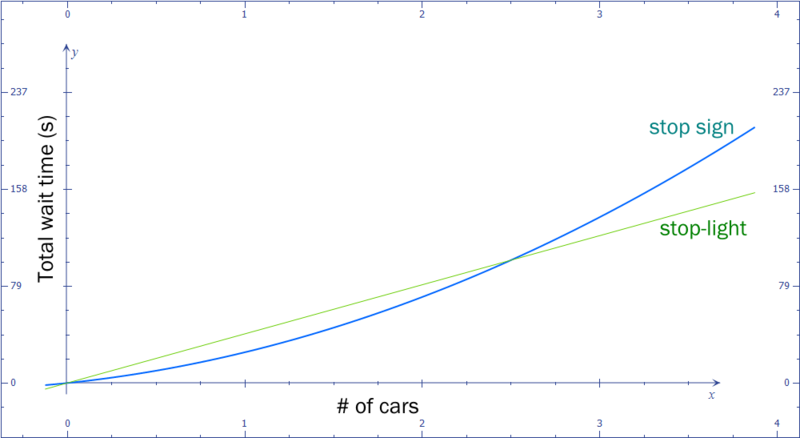 But there’s a bit of a problem: the units (# of cars). “Number of cars” isn’t very descriptive. If we’re evaluating this via traffic, we’ll need something like “number of cars per minute”. 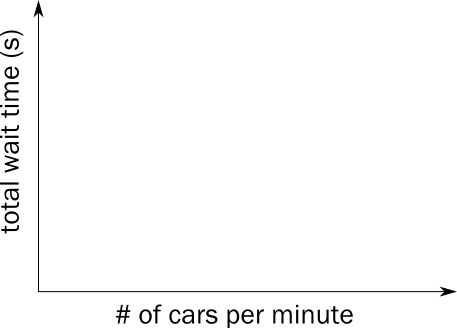 And if that “number of cars per minute” exceeds the individual wait time of the cars at the intersection the total wait time will increase exponentially. 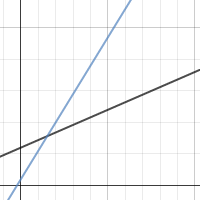 So, let’s switch our independent variable in our models from “number of cars” to “number of cars per minute.” So our axes for our graph will look something like this. Once again, I’m going to give another intermission at this point. Partially because I want to let you ruminate on this quandary, and partially because I need to think about how to model this. Hopefully the intermission between Part 2 and Part 3 of this post won’t be as long as the one between Part 1 and Part 2. Be sure to give feedback/corrections/suggestions in the comments! A few minutes ago the other day, NPR’s Mike Pesca tweeted his mathematical rule as to what constitutes a “blown game” in basketball. That means if at any time a team is winning by (# of minutes left in the game)+4, and loses, that’s a “blown game.” There are 48 minutes in a NBA game (40 in a NCAA game). So let’s graph what that could look like. Can we use math modeling and/or equations to answer the question of when it becomes advantageous to install a stoplight vs. a stop-sign? Can we “ambush” students by having them create equations without really knowing it? What are some of the things we need to know about this? How long does a car usually stop at a stop-sign? And how long does it take to start up again? How long is the red light at a stoplight? Can we adjust this? What’s the time gap between a red-to-green light transition? A couple seconds? How long does it take a car to pass through an intersection? What’s the speed limit here? Have students use their iPhones or flip-cams to conduct some tests. For instance, here’s a couple of run-throughs through stop-signs in my neighborhood. Stopwatches at the ready! Improperly mashed-up music & driving video now! Each test took me about 10 to 15 seconds to slow down, come to a complete stop (as I’m sure all your students do) and then get back up to full speed. So it seems reasonable to assume that a stop sign will cause each vehicle about a 15 second delay, even if there are no cars around. Assumption #1: It takes 15 seconds to go from full speed, to fully stopped, to full speed again. If there were another car in front of us, there would be an additional wait time. Let’s say 10 seconds per car in front of us. Assumption #2: We wait 10 seconds per each car that is also at the stop-sign. Assumption #3: No matter the direction the other car is coming from, we wait 10 seconds to advance. What about the total wait time for all cars? We’d have to multiply by the number of cars. I’m going to cut things off and let you ponder this a bit. I’m sure I’ve made mistakes and false assumptions. I’m also going to let you guys think a bit about how we could represent the wait time for all cars at a stop light. Couldn’t you see this sprawling into a really interesting Algebra project? Imagine students developing this model and bringing it to a community meeting or city planning gathering of some sort. It could happen. Stay tuned for Part 2, and be sure to correct my math in the comments below!